Just a quick reminder that the expo for our March production of Richard III is Wednesday 22nd November, 19.30 at HQ. The auditions will be on Sunday 26th November, 15.00 at HQ and Wednesday 29th November, 19.30 at HQ. Don’t miss out! What a lovely way to round off our 70th anniversary year! The productions of Loose Canon and Harlequinade were absolutely delightful, full of humour, pathos, timing and energy. Huge congratulations to the cast and crew of both, it looked like you were having a lot of fun. It’s just a shame that it means our company is over – as according to the folks in Loose Canon, our Will didn’t write any of the plays, so what’s the point of a Shakespeare company?? Anyway, we in the SSA never stand still, so time to look forward to our March 2018 production of Richard III at the Square Tower. The important information that you need to know now is that the expo is on Wednesday 22nd November, 7.30pm, at HQ. Rob Bartlett will be outlining his vision for bringing the ghastly Gloucester to life in full medieval splendour, so make sure you are there. The auditions will follow on Sunday 26th and Wednesday 29th November, times tbc. Now is the Winter of our Content………..
Whilst the casts of Loose Canon and Harlequinade rehearse their way towards November’s productions, news arrives of our next presentation – Richard III. This wonderful play, directed by Rob Bartlett, will be at the Square Tower from Tuesday 6th to Saturday 10th March, 2018, and Rob will be sharing his vision at the expo on Wednesday 22nd November, 19.30, at HQ. The auditions will follow on Sunday 26th and Wednesday 29th November, times for which will be confirmed nearer the dates. Rob is promising an authentic and visceral working of this classic text, so please come along and be part of it. Whilst you are here, don’t forget to buy your tickets for November’s joint production. You can already get tickets for Richard III as well! How organised are we?? Ok I’m biased, inevitably, but Conflicts, Seduction and Attempts On Her Life was a bit special. It was one of those evenings where the SSA comes together at HQ and something great happens – in this case it was three experienced actors trying their hands at directing for the first time, and what the audience got was stillness, power, comedy, physicality, pathos, anger, lust, love, farce, all presented with a huge amount of thought about movement, timing and staging. Massive congratulations to Courtney, Hazel and Mike for their directing debuts, and to their skilled cast members, all of whom contributed a huge amount to this fantastic evening. Finally a big thank you to Amy for pulling all this together, from the original idea pitched at committee through to this wonderful execution. The time may be right for lovin’, it may even be right for dancing in the street, but it is definitely right for acting! Amy has been working hard on the Summer Showcase event, details of which are on this page – it all starts with the expo on Sunday 9th July, so don’t miss out. Happy Birthday To You, Happy Birthday To You, Happy Birthday……………. Our 70th birthday party, held in the Square Tower on Friday 5th May, was a wonderful event. It was lovely to see so many members, old and new, and a real privilege to have our most senior member, Len Russell, cutting the birthday cake. A huge thank you is due to Paula, Amy, Lauren and Bex for pulling it all together, and to our Chairperson, Terry, for his memorable words during the party. Here’s to the next 70! How Terribly Strange to be 70! Well our 70th birthday year is in full swing. First of all a huge bunch of congratulations to the cast and crew of Pericles, it was a great play with excellent reviews. Being in the Square Tower again was lovely, it’s a building that adds such atmosphere to every production. Our next main house production will be Rattigan’s Harlequinade, to be presented at the Station Theatre, Hayling Island in November, with an as-yet unnamed companion piece. There will be more details on this in the next few weeks, so come back here to keep in touch. To fill the gap between now and November we are looking to put on an evening of scenes directed by new directors, as we know there are many members who really want to try their hand at this in a safe and supported environment. Word has already gone out to the membership about this event, so if you are interested, please respond asap. Last but not least – Party! We are having our 70th Birthday Party very soon, all the invitations have gone out and it promises to be a great night. See you there! 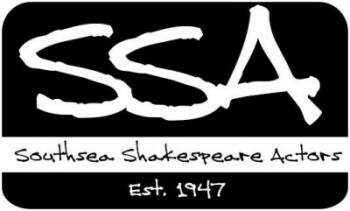 New photos from November’s As You Like It and September’s Murder in the Cathedral are now available on the SSA Gallery page – so go and have a look!